This is my card entry for the "Fantabulous Cricut Challenge" We are to make a project using any type of bug AND use the color orange somewhere on our project. This card is 5 ½" X 4 ¼". 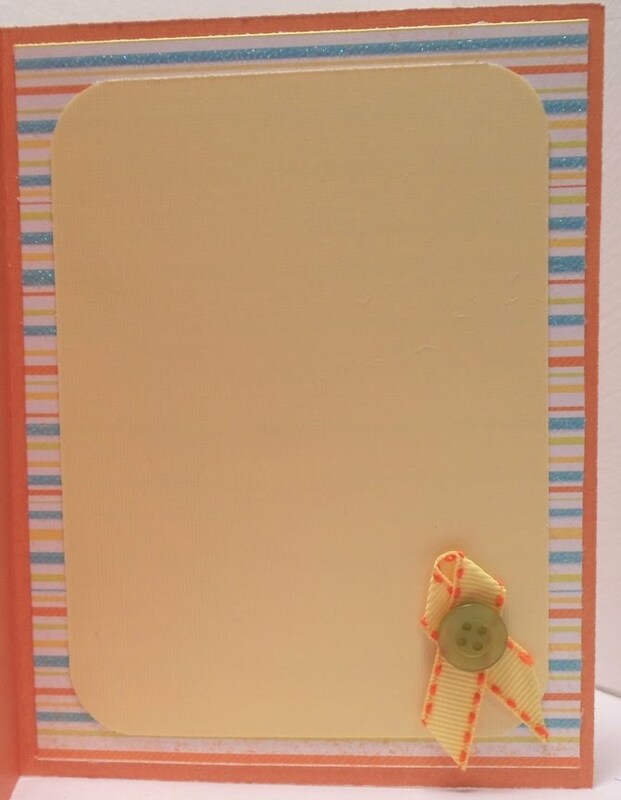 The floral, striped and yellow backgrounds are all 5 ¼ " X 4". The floral print was cut using center point at 2" and the striped print was cut using center point at 2 ½". The yellow was left alone and placed behind both prints. punched with an EK Success edger punch. 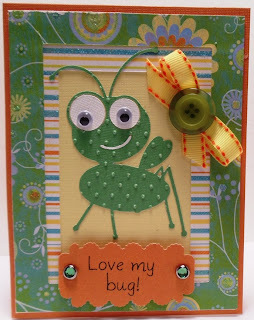 I then stamped the phrase “Love my bug!”on tag using my new stamp set from My Pink Stamper called "Buggy Punnies". Finally, I finished it off with a pretty bow and button embellishment and some green brads on the tag. It's a Cricut!! I've never seen that cut before. In fact, I read your recipe to see how you made him, only to discover he's actually a cut on a cartridge! I've never even looked at Storefront before and didn't realize the cuts were all related to ProvoCraft. Thanks for the lesson! Great card, by the way! 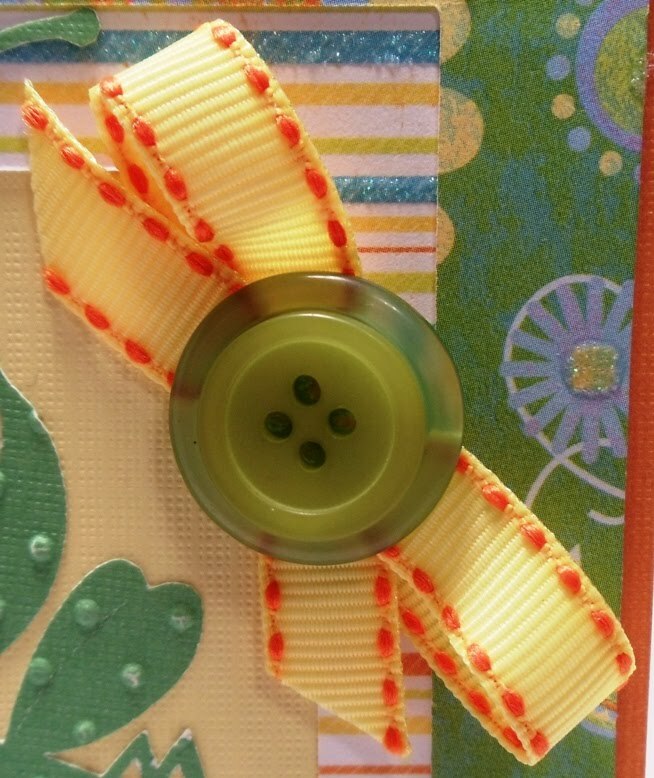 I love those papers and the bit of ribbon and button. Well done! Thank you everyone! 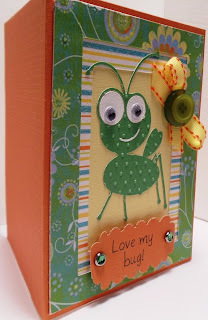 I couldn't WAIT to use this cartridge for this bug challenge:) I love it!!! Very cute! 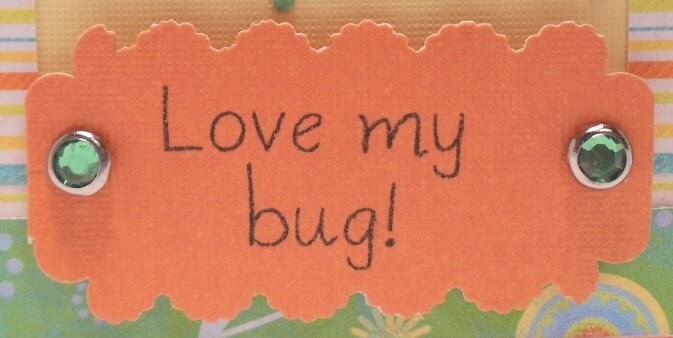 I love my bug too LOL! I have this cart but never cut this before just the head. I guess I should. 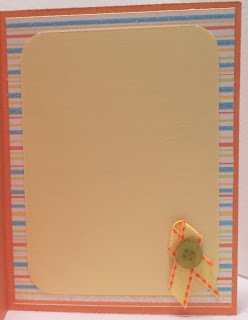 Love your ribbon and button,and the embossing! This is adorable! Good luck on the challenge. Super cute! love the texture you put on the bug! Awe! 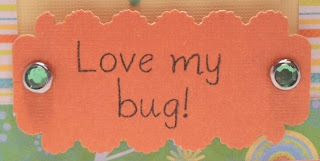 I love my bug too! 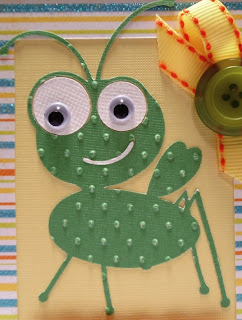 :-) Very cute card! Thanks for participating in the Fantabulous Cricut Challenge! Oh, how very sweet....and adorable!! Thanks for playing at FCCB!! Love Love this card. Hhhhmmmm, wonder if I can still find that cart somewhere???? I'm off to look. Thanks for the inspiration. I out right chuckled at that little cutie. Thanks for sharing with us at FCCB. Hope to see more of you! Super cute cricut. I have just the head on one of my cartridges, but I like the entire image. Great color combination. Wow!! Totally adorable, just love the embossing on the bug:) Thanks for playing along with us at FCCB! how stinkin' cute!!!! I am totally gonna have to go get that store front cart now! Gr8 card i am on the cricut circle where did they announce this challenge at?